I think it is just funny how he rambled on forever talking about Apple and Steve. I just hope he wont’t regret his decision. 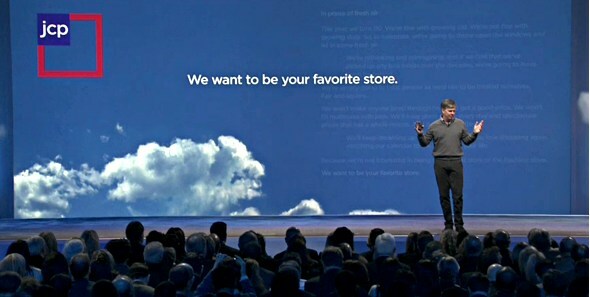 BTW : Thank you Ron for the Apple retail stores! I actually like the old Penney’s so far. No more coupons, their sales flyers are so minimalist they’re absolutely useless- inside, it’s the same old merchandise. (At least in the men’s department.) Boring. — ron Johnson is good. I wonder how Browett would perform for Apple? Haven’t shopped at Browett previous shops but the photos look bad. — revamping stores is great BUT does JC Penney have the ‘Goods’ ? Apple stores have crazy sales not just because of the store conecept etc but the PRODUCTS. JCP has one of the largest databases on customers in the world; over a century. There was a story recently ( I saw it on Colbert) about how Target knew a man’s 17 year old daughter was pregnant before he did. This was because they have a great data mining partner. They can tell by a few idems a woman has bought that she is probably pregnant, and how to market to her. Imagine what one could do with a hundred years of data on buying trends. Apple is good at databases too. I think that is why he went to JCP, they have a goldmine and no idea how to use it. RJ has just entered the unfounded hype zone. In order to succeed like he did at Apple, Ron Johnson would need “gotta have” products like Apple had. JC Penny doesn’t have any, period. All they can boast is lower prices … just like Dell, Acer, Winners, Walmart, etc. Hard to get truly excited about that. Ignoramus writer. Ron Johnson knows what he’s doing and while it may take a little longer than usual to effect a turnaround, moving the brand away from its stodgy, fuddy-duddy image is a great start. When customers also realize the wisdom and the value of the store’s new pricing strategy, they will come (or come back). Now is not the time to quit. Ef these hedge fund managers; bottom feeders who will do human civilization a huge favor if they all commit seppuku.